Wreckage at crash site of Ethiopian Airlines Flight 302. Ethiopian Airlines flight 302 had an unusually high speed after take-off before the aircraft reported problems and requested permission to climb quickly, said a source who heardto the air traffic control recording. A voice from the cockpit of the Boeing 737 MAX requested to climb to 14,000 feet above sea level – about 6,400 feet above the airport – before urgently asking to return, the source told Reuters on condition of anonymity because the recording is part of an ongoing investigation. The plane disappeared from radar at 10,800 feet. “He said he had a flight control problem. That is why he wanted to climb,” the source said, adding no further details were given of the exact problem and the voice sounded nervous. Experts say pilots typically ask to climb when experiencing problems near the ground to gain margin for manoeuvre and avoid difficult terrain. Addis Ababa is surrounded by hills and, immediately to the north, the Entoto Mountains. The New York Times reported Captain Yared Getachew’s voice on the recording but the Reuters source was not familiar with his voice or that of the first officer Ahmed Nur Mohammod Nur to verify who was speaking. It was the same voice throughout, the source said. The US Federal Aviation Administration last week followed other countries in grounding the 737 MAX, citing satellite data and evidence from the scene indicating some similarities and “the possibility of a shared cause” with October’s Lion Air crash in Indonesia that killed 189 people. On Saturday, investigators began studying the cockpit voice recorder. 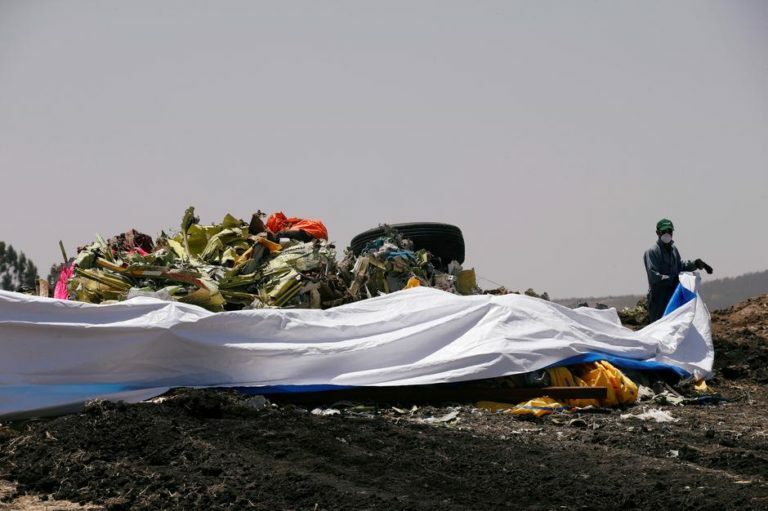 Along with the flight data recorder, the information will be evaluated by Ethiopian authorities, teams from Boeing, and US and EU aviation safety authorities to determine the cause of the crash. The Ethiopian flight was set to follow the Standard Instrument Departure (SID) from the airport and used standard procedure with a first contact just after departure, the source said. Everything appeared normal. After one or two minutes, the voice on the air traffic control recording requested to remain on the same path as the runway and to climb to 14,000 feet, the source said. The aircraft’s ground speed after departure was unusually high, the Reuters source said, reaching around 400 knots (460 miles per hour) rather than the 200 to 250 knots more typical minutes after departure. “That is way too fast,” the source said. No more than two minutes later, the air traffic controller was in communication with other aircraft when the voice from Ethiopian Airlines flight 302 interrupted, saying “break, break” – signalling other non-urgent communications should cease. He sounded scared, the source said. After starting the turn, the aircraft disappeared from radar at an altitude of 10,800 feet above sea level, the highest reached during the six-minute flight. Addis Ababa’s runway is at an elevation of around 7,600 feet, suggesting the doomed jet made it about 3,000 feet into the sky. Flight tracking website FlightRadar24 had data covering the first half of the flight but it dropped out at 8,600 feet. Other satellite data tracking flight 302 has not been made available publicly. In the Lion Air crash, investigators are examining the behaviour of a new anti-stall system on the 737 MAX that led to the aircraft gaining and losing altitude as pilots fought for control against the automated system. Boeing is expected to finalise a software fix for the system within a week to 10 days, sources familiar with the matter said.